The Playmobil Hospital is an amazing toy for any child who enjoys pretend play. An incredible addition to any family's collection. This Playmobil Hospital Set is pretty marvelous. 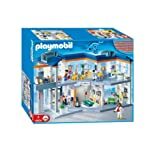 It carries the well known and respected Playmobil brand and it definitely lives up to expectations. It won the Oppenheim Gold seal and got nominated for the Platinum award. This just confirms what parents and children know already. This set is like the Porsche of Hospital playsets. 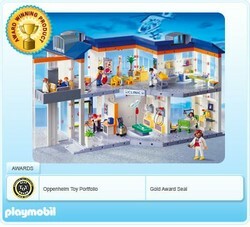 Take a look at the picture below and see just how much you get when you obtain the Playmobil Hospital set. This Playmobil Hospital Set really does contain a whole load of pretty realistic items. I have three daughters who I wouldn't mind encouraging towards medicine or some other healthcare profession (Deep down inside, I am a pushy parent! ), this set gives them the opportunity to pretend to be a doctor and practice their skills on any of the characters that come with the set and this they do with gusto. Having this Playmobil Hospital in our house is a source of great entertainment as the older girls play for ages with it. The one negative thing about the Playmobil set is the HOURS required to put the whole thing together. That is what you will definitely pick up from any reviews you read. Just approach this as a project to do with your children (they will probably lose interest! ), then it does not seem all that bad. It becomes a challenge to put it together as quickly as you can. Can you beat my three hours? When you do put this together, it is amazing, there is so much that your children will be able to do with it. Have a look at the video below for an example of the kind of creative and imaginative play sessions that your children will enjoy. In order for them to fully appreciate this, it may be best to wait until they are at least 6 years old but I must admit, my daughter who is four loves the Playmobil sets - the only problem is that she loses the bits quite easily especially with her little sisters around. It is definitely loved by my daughters but my supervision is required, at the end of all play times, to keep all the components in the same place. Playmobil Hospital and its attention to detail. The attention to detail on this item is another example of the Playmobil superiority when it comes to building sets. Little things like a charging port for the cordless phone on the reception desk, cots with adjustable sides, foldable and adjustable hospital beds, a giraffe height stand to measure the playmobil patients and more- all of these things make this a toy set that any child will adore for hours. There is even a clown for the children's ward. 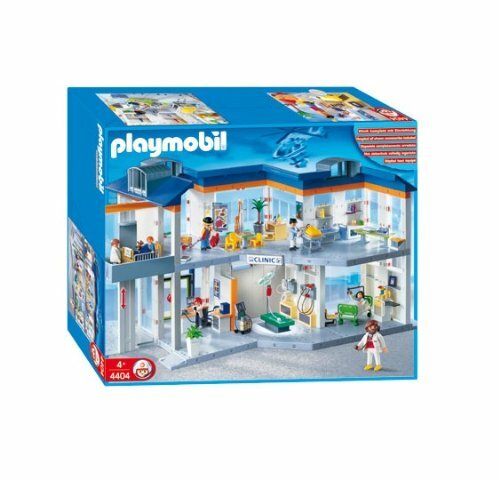 The Playmobile Hospital set is truly something. Owning it is a milestone every parent will want to have in their child's life. Looking for Playmobil Green Dragon Knights? This range includes dungeons, dragons, knights, a cannon and more. Everything you need to ensure that the Green Knights win!